For the kids (serves 2): In a large pot of boiling salted water, cook pasta until al dente, according to package instructions; add peas 1 minute before end of cooking. Drain; return pasta and peas to pot. Meanwhile, in a large skillet, combine cream and chicken broth; simmer until thickened slightly, 7 minutes. Stir in Parmesan until melted. Add sauce to pasta and peas; toss to combine. Season with salt. 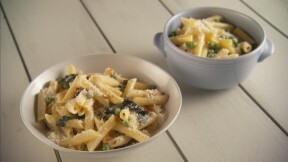 Divide half the pasta among serving bowls; reserve remaining in pot for the adults. For the adults (serves 2): Toast pine nuts in a skillet over medium heat, shaking frequently, until golden, 1 to 2 minutes. Add to reserved pasta along with arugula; season with pepper. Toss to combine, and serve immediately.